SAPHARI will bring to fruition co-workers in real world applications using the new technologies of soft robotics that combine cognitive reaction and safe physical human-robot interaction. We will expand and improve the functionalities of robotic systems and further develop relevant features, such as autonomy, safety, robustness, efficiency, and ease of use. Below we summarize a list of measurable RTD objectives that will be reached by SAPHARI. A set of systematically generated results from robot crash tests in well-defined impact conditions will be collected and analyzed to assess the influence of relevant physical parameters of robots, humans, and environment on potential injuries. A series of novel VIA prototypes embodying physical principles such as stiffness and damping will be designed and implemented. The new units will range from fixed or variable passive compliance, to variable physical damping modules, and to units that will permit the regulation of both the stiffness and physical damping. The Variable Stiffness Actuation technology will be embedded in elementary but complete electro-mechanical units (Qbots) of low cost that can be assembled in modules at will. 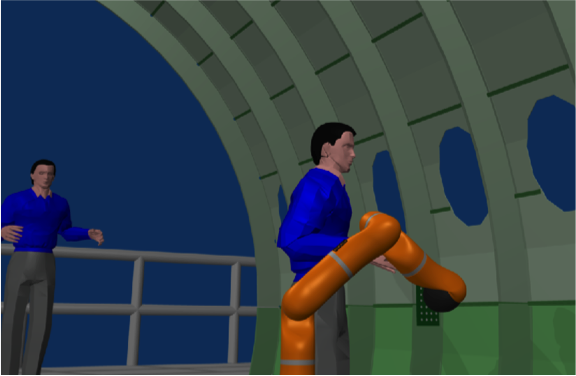 Full upper body prototypes including torso, two arms and two hands will be designed and demonstrated based on the VIA/VSA technology. VIA technology allow in principle to regulate both joint stiffnesses and link positions of the robot. However, the highly coupled and nonlinear system dynamics make a hard task to design control laws being able to simultaneously and accurately track desired and independent trajectories of stiffness and motion. Moreover, there is no direct sensor of joint stiffness, damping, or impedance to be set under control. We will develop on-line, robust estimation methods for these physical quantities and use them in the feedback control laws. Force and impedance control are by now standard in conventional robotics. 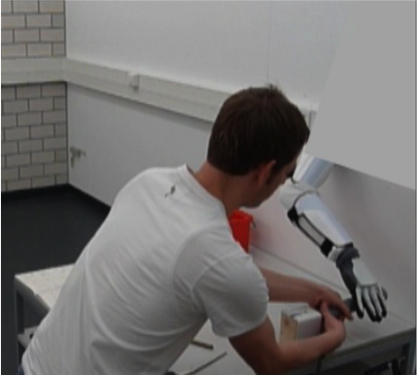 The first contribution of SAPHARI to this area is to rigorously extend the theory and develop the practice of interaction control to the class of robots with flexible/VIA joints. In addition, we will design control laws that allow a compliant robot to execute tasks requiring intentional and continuous physical contact with the human, while preserving safety. Robust and safer low‐level robot strategies will be developed so as to anticipate undesired collisions and react properly to undesired or continuous intended contacts, thus suitably combining perception and control issues. Measured signals coming from multiple heterogenous sensing modalities will be transformed into common, physically interpretable quantities e.g., distances or, possibly virtual, forces. Under wide range monitoring, we consider not only a wide spatial range but also a suitably long time interval. In order to cope with large workspaces, such as those of the two industrial use cases in WP8, different external sensors (e.g., depth and presence sensors) will be selected and optimally placed, so as to minimize the loss of information in occluded areas behind sensed obstacles, maximize the supervised areas, and obtain an optimal trade‐off between information gain and additional costs. A safer robot behavior will be ensured by predicting the future state of the environment, so that possibly dangerous situations can be anticipated and conflicts in planned task execution timely detected and avoided. We will develop a system providing the robot with the capability of interpreting single human gestures and sequence of gestures, following an approach that was used also for natural language analysis and interpretation. A repertory of gestures associated with gesture classification methods (HMM, SVM, or MPL) and gesture grammar to interpret complex gesture sequences will be defined. A new algorithm for incremental learning of force patterns and impedance behaviours will be developed and demonstrated. The algorithm is based on augmentation of an on-line human motion imitation approach with a kinesthetic demonstration approach. We will develop and demonstrate a motion planning framework for generating reactively adaptable motion plans that can be deformed on line in response to environmental changes. A software framework providing so-called Reactive Action Generation Patterns (AGE-Ps) will be developed and demonstrated. AGE-Ps combine controller settings, trajectory generation, environment observers, and safety features, including action search algorithms in real time, and allow to manage the high variety of interactive robot behaviours. The methods will be preliminarly demonstrated in an interactive assembly scenario at DLR, consisting of assembling a toy train with the LWR. We will demonstrate a prototype of a robot-user multimodal bidirectional interface for safe hands-on programming in pHRI, using a hardware interface device directly attached to the robot. The software interface will provide means of combining and parametrising program modules in an intuitive, visual way, while having a graphical, icon-based description of the current robot state. We will develop and demonstrate novel techniques for navigation and manipulation task planning of complex robotic systems sharing the space and/or in physical interaction with humans. 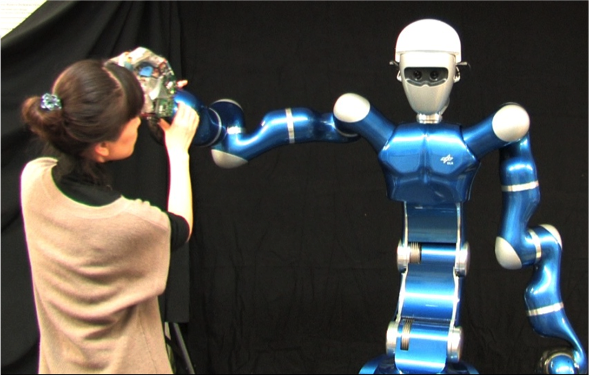 We will develop and demonstrate generic robot abilities to conduct a collaborative task with a human partner. During the first year, information will be collected from the external community of service robotics and low-throughput industrial companies on the possible robotic tasks that require pHRI, even beyond those envisaged by the project. We will demonstrate the integration of project results within three use cases: one in collaborative activities in the robot manufacturing industry (at KUKA), one in the assembly of aircraft parts in the aeronautical industry (at EADS), one in a hospital environment (demo at DLR). One of the two foreseen scenarios (the “preparatory of everyday tasks”, the other being the “hand-over of surgical tools”) will be revised after the first project year. These use cases do not exist for the moment, due to the limitations of current technologies for safety in pHRI: compliant lightweight robots with active task-dependent variable impedance, sensory-based surveillance of close/physical human-robot collaborative activities, risk assessment and safety monitors definition, planning navigation and manipulation tasks that are adaptable and legible to the humans, real-time reactive robot behaviors for completing tasks shared with humans and involving intentional contacts and unexpected collisions, kinesthetic teaching and incremental learning of complex pHRI tasks, robust control of whole-body exchanged forces and impedance behaviors in dynamic environments, as well as hands-on programming for unexperienced users.